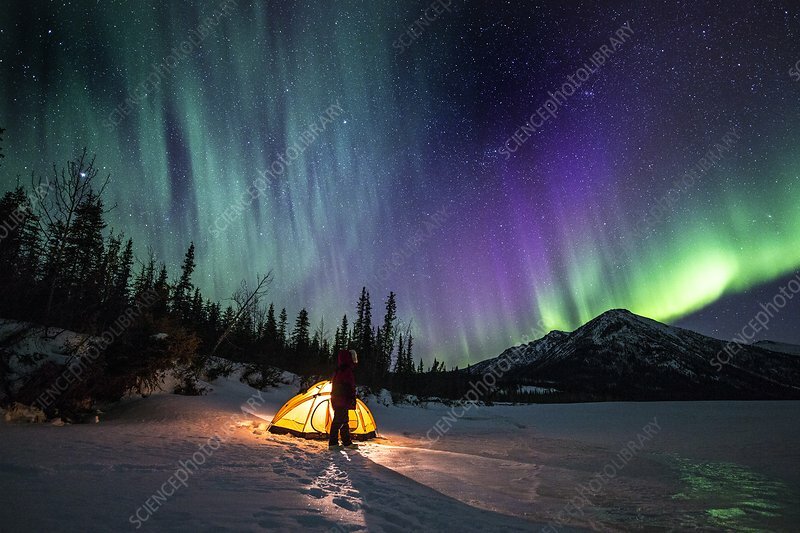 Aurora Borealis illuminates the landscape over a camper and their tent by a frozen river in Northern Alaska. The Aurora Borealis (northern lights) is an atmospheric phenomenon that occurs at high latitudes, appearing as shimmering bands of coloured light in the sky. It occurs when charged particles in the solar wind are directed towards the poles by Earth's magnetic field. There they collide with atoms in the upper atmosphere, causing them to emit light. The colour of the light depends on the atmospheric gas involved. Green is produced by excited atomic oxygen. Photographed by the Koyukuk river in Northern Alaska.